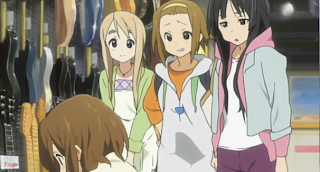 Madman have released the first four episodes of K-On!, the smash hit series based on the four-panel manga phenomenon by Kakifly. 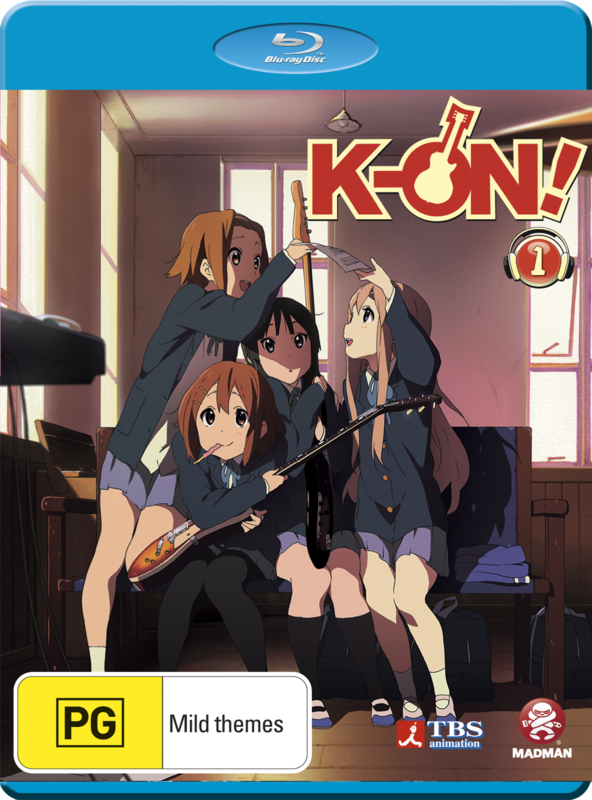 Although reasonably unknown here in Australia, K-On! sold it's socks off in Japan before being released in English by Yen Press. 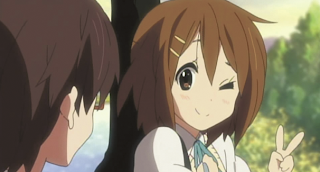 "When Yui Hirasawa enters high school, she wants to join a club but can’t decide which one is right for her. Fortunately, the Light Music Club is desperate to find another member or they’ll be disbanded! So, with the enticement of delicious snacks and assurance that no musical experience is necessary, Yui joins the Light Music Club. 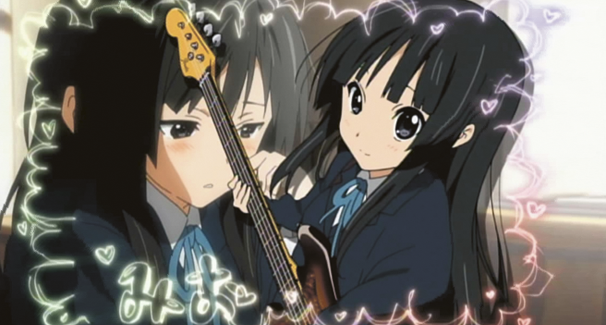 She becomes the guitarist in this all-girl high school rock band with Mio Akiyama on bass, Tsumugi Kotobuki on keyboard and Ritsu Tainaka on drums. Together, they’re going to rock the school and someday make it to the Budokan! Now, if only they can put down the snacks just long enough to practice…"
K-On! is short for Keiongaku (Light Music) and is the focus of the entire series. Apart from that it is incredibly difficult to place it into a single category, it takes the best elements from many before creating the wonderful series that it is. Thankfully, writer Reiko Yoshida (Kaleido Star, Angelic Layer) focuses on the characters who are all incredibly likable and oh so cute! It would have been easy to pander to the lowest common denominator and although there is a small amount of fan service, almost an obligatory amount, it isn't enough to take away from the story or degrade the characters. I have always had an issue with overt fan service so this is a breath of fresh air. The story is as sweet as the highly detailed deserts that the girls tuck into at every opportunity. It is a fun story of Japanese High School Girls and their adventures in a wholesome extracurricular club, the Light Music Club. 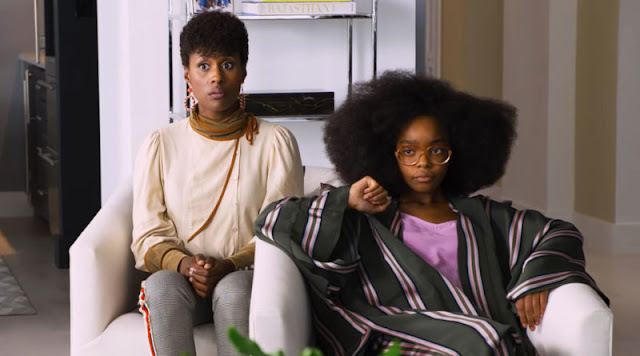 This series is fun for all, male, female, young and old. Each episode starts off with "Cagayake! Girls" by the series' Japanese voice actresses Aki Toyosaki, Yoko Hikasa, Satomi Sato and Minato Kotobuki and ends with "Don't Say Lazy" by the same. Both are incredibly fun, energetic and addictive pop tracks that, when released by Pony Canyon, tore up the Oricon charts. If only someone would release the soundtrack here in Australia, I'd be all over that! The musical numbers throughout are downright fun and watching the characters play their respective instruments is actually very impressive as the animators have managed to sync each characters movements flawlessly with the music. 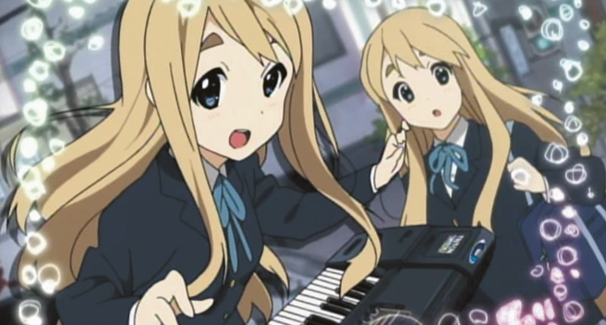 When Mio plays her Fender bass, Ritsu her Yamaha drum kit, Mugi her Korg keyboard and Yui her sunburst Les Paul you could be convinced that they are actually playing. Using the actual licensed products is a nice change from the "Bender" and "Gibbon" instruments that I was expecting. The animation is of an incredible standard. Kyoto Animation (Haruhi Suzumiya, Air, Full Metal Panic? Fumoffu) created an instantly recognisable Kyoto shopping district, an area for which the K-On! girls are now official ambassadors. Each and every scene as so much to admire, from beautiful sakura filled backgrounds to the detail on each instrument the animation is nigh on perfect. The is wonderfully complimented by the flawless Blu Ray transfer by Madman. There is not a single artifact in sight and the picture is as sharp as it is vivid. Forgive me for gushing but there is just so much to admire in this series. Voice overs are always a touchy subject but in this release, they are great across the board. The original vocal cast are the perfect match but their English counterparts aren't far behind. As a group they sound like they are having a blast and quickly find their groove in bouncing off one another as I'd imagine the Light Club would. Cassandra Lee (Gundam Unicorn, Durarara!!) 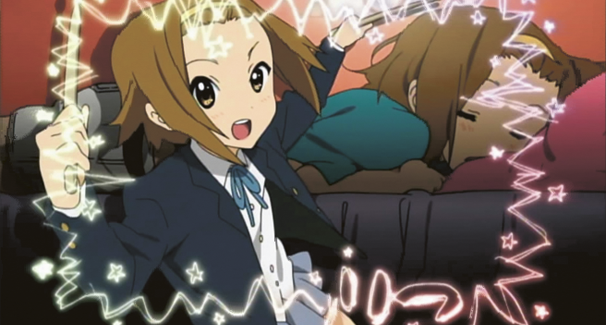 as Ritsu is hilarious and plays the semi-bipolar drummer perfectly. Like the beats of a drumkit her comic timing is flawless. The special features are a little light but keep in mind that this is only the first of four volumes. Hopefully some music videos and other videos will make an appearance in later volumes. On volume one you will find the obligatory Madman trailers and an interview with Stephanie Sheh, the English voice actress of Yui. K-On! left me wanting more, which is never a bad thing (I think they call this an addiction!). In the meantime I think I'll just have to pick up some of Kyoto Animation's other series Kanon, Air , Full Metal Panic? Fumoffu and Full Metal Panic the Second Raid. As a fan of the manga, I am glad to see that the animation lives up to the fantastic foundation that Kakifly laid. The only downside that I can think of is that I have to wait MONTHS until I get to watch the series in its entirety! K-On! Volume 1 is available on Blu Ray and DVD from Madman now. It is also available with a special volume one collectors box.